The award ceremony was made by the journalist Alberto Giori before the Brescia-Inter Italian Cup match. The event, conceived and organized by the far 2006 from calciodonne.it (Walter Pettinati), previously recognized with the patronage of the FIGC, LND and the various Ministries, first ever to give recognition to the players and the women's football movement, electing the best soccer players who play the grass of the Italian Serie A, with an eye on the young promises and the mister. 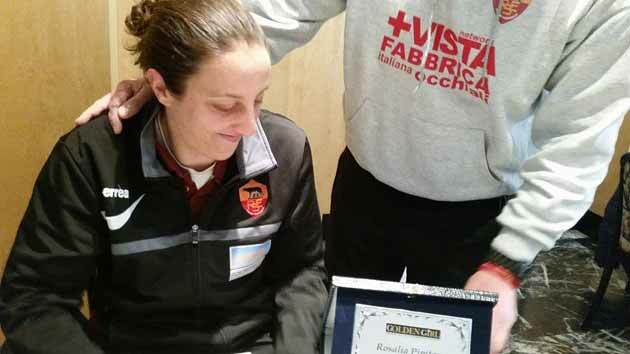 The Par-all of the Res Rome received the Golden Girls award of "Best goalkeeper 2013-2014" delivered by calciodonne.it to the Giallorossi. The number ONE of the Res Rome continues to amaze Sunday after Sunday and despite its excellent performances, which in the past season have brought this important recognition obtained with the preferences of the coaches of the teams of Serie A, continues, unjustly, to be excluded from the National . Best talent under 19 of last season. 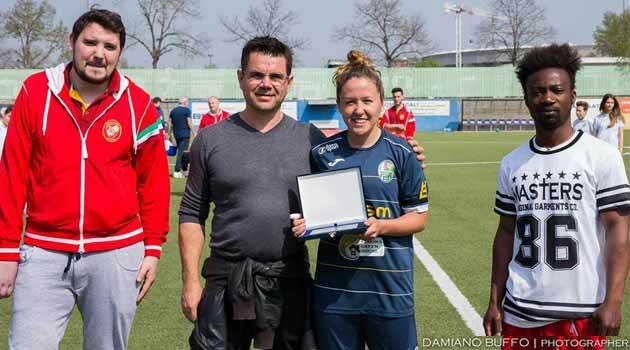 Martina Gelmetti received the «Golden Girl» award on Saturday 11 April at the Olivieri Stadium, just before the kick-off of Verona-Pink Bari (7-1). The technicians of series A have voted the striker of the ASM as the youngest of the 2013 / 14, in ex aequo with Aurora Galli of Torres. Martina, 1995 class, has therefore won the traditional recognition established by the site www.calciodonne.it, thanks to the ten goals (personal record) scored last season. 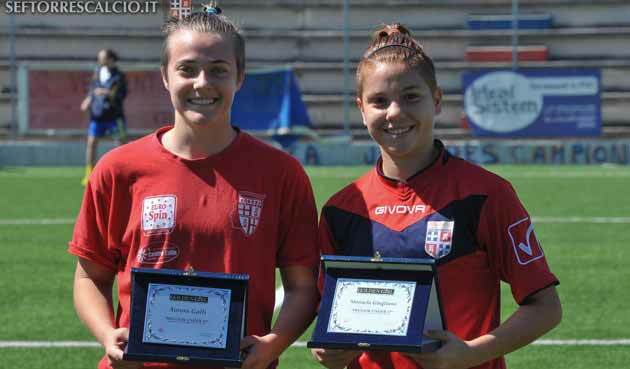 Torres's two rossoblu received the "Golden Girl" award for the best Under 17 and Under 19 for the 2013-2014 season. The two teams have won the prestigious award - established by calciodonne.it - ​​as the best young people with the votes received by the coaches of the teams of Serie A crowning a season full of satisfactions and excellent performance. It is Daniela Sabatino, striker of the Italian champion Brescia and head-scorer of last season, the Golden Girl of Italy for 2014. Agnone's goalscorer, who with his 35 goals in 30 played matches has contributed significantly to the conquest of the double Scudetto - Supercoppa by the lionesses, receives the right recognition for a record year, on a personal and team level, adding another trophy to a dream board. But let 's go with order: it' s the last day of the year but the editors of calciodonne.it do not go on holiday and, according to a tradition that lost by 2006, we reserve the last piece of 2014 to elect the best players who take the grass of the Italian Serie A, with an eye on the young and the mister. In addition to the jewel of the advanced section of the lionesses, which logically ticks even as best striker by winning the competition of legends of the national football as Panico and Gabbiadini, Brescia is picking up prizes in several categories.